All the instruments that I have built I have spent much time with as a player or handling in terms of repair or restoring. So when Toronto banjo player Jamie Stone asked me to make him a banjo version of my electric guitar, I was in some new territory. I wasn’t sure what was most important for banjo player. The fact is the banjo represents the basis of plucked stringed instruments that would follow it out of Africa. Through the middle east (tambor, tar and oud) to Indian (sitar and sarod) and along the silk road into asia (the samisen and koto) and up into Europe with the lute and finally the guitar. This instrument is reabsorbing some influence from the electric guitar. I learned a lot from making that first electric banjo. When Bill Evans and Henry Kaiser commissioned a set of electric banjos, I took what I learned from that prototype. This time around I didn’t try to imitate the electric guitar. Instead I concentrated on incorporating the essence of the banjo. The construction is more acoustic than electric, and emulates the banjo construction more than electric guitar construction. 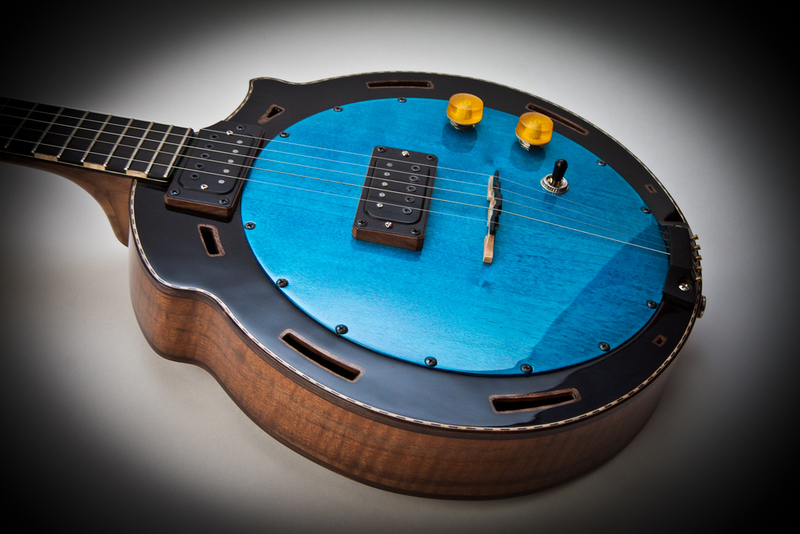 The 26″ scale provides a circular soundboard surrounded by a ported amplifying chamber. 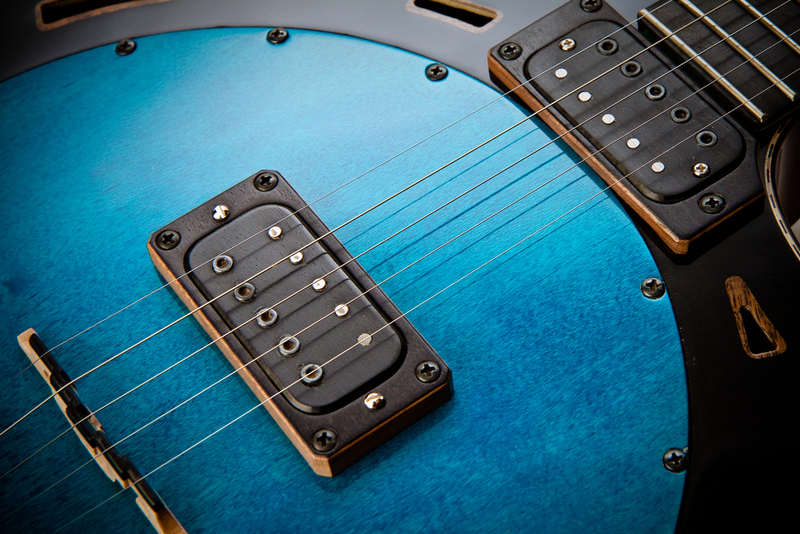 The pickups are hand wound Alnico 2 or 5 humbuckers with optional bridge transducer. The neck is mounted by the heel stick that runs through the central well – in fact the construction is fairly ‘dobro-esque’. 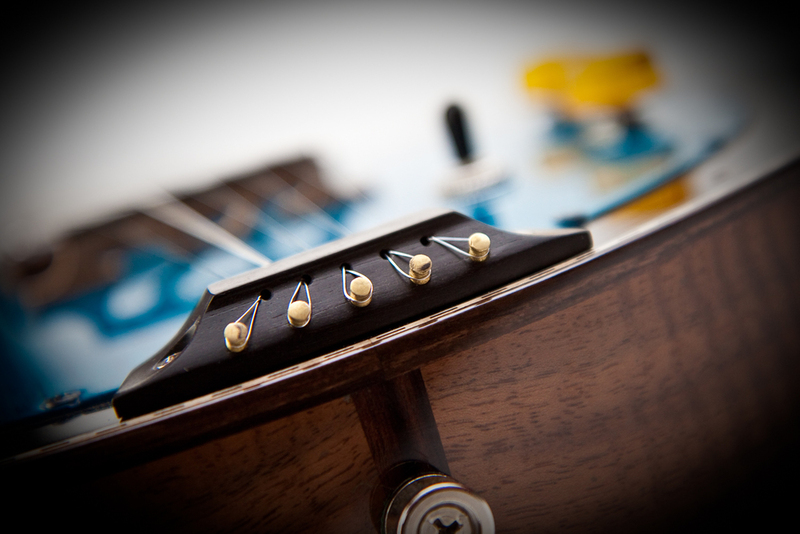 The tuners can be configured with 5th string and fret tuner or 5 straight through to the nut, with 5th string tuning hooks.